If you’re on the lookout for a campsite in Sardinia or, better still, a coastal campsite in Sardinia… you can’t do better than Cala Ginepro! Cala Ginepro is a campsite in Sardinia with three access routes to the sea. It looks out over two beaches of fine white sand, which face in different directions, with a smoothly sloping seabed that is suitable for children, and over the captivating reef, with its rocks of pink granite. Against the backdrop of the Gulf of Orosei and the pristine Mediterranean maquis, myriad opportunities for relaxation and fun await you! 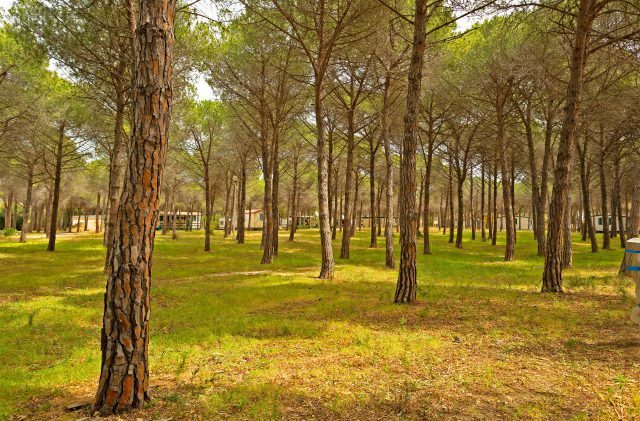 On our campsite in Sardinia, you will find numerous pitches for holidays in a tent, air camping, in a caravan or a camper van. If you have your own vehicle and you prefer the convenience of an on-site structure, we offer four different types of bungalows/mobile homes. All of the mobile homes/bungalows have a weekly linen change, but each has different specifications and features. Campsite accommodation includes, free of charge: electricity, with multiple power points; hot showers; the entry of a car or motorbike; parking in the dedicated areas; the use of the barbecues and the dispensing of drinking water. If you have booked a bungalow, your stay includes your energy consumption and, from June to September, a parasol with two sun loungers on Cala Ginepro beach. In addition, our campsite in Sardinia makes it easy for you to play all the sports you could want, and we also offer the hire of kayaks, windsurfing equipment and mountain bikes. Moreover, you can choose from the numerous options at the bar and the restaurant pizzeria, where the chefs serve up delights from the land and sea along with artisanal ice creams. Book your holiday at our coastal campsite in Sardinia! We look forward to seeing you in Orosei, with all of the services and facilities you could wish for.